Mark Evanchick of Darien, left, shown in a 2016 game, and his Penn teammates will take on Vermont at Wilton High on April 27. MIDDLETOWN — At first, going down to Milford for the first varsity game in Middletown boys lacrosse history, the Blue Dragons were a bit intimidated. “It’s not what we’re used to,” classmate Ian Corvo completed the thought. Coach Weve Valery apparently knew what he was talking about. The Blue Dragons are off to a 3-1 start, winning 11-5 at Law on March 30 to start, debuting at the varsity level after three years of junior varsity and a history as a club team before that. “The fact that we’re young, I think these kids are hungry. These kids want to prove themselves,” Valery said. “Next year, (the experience) is definitely going to be a strength. Defensively, it’s going to help. Middletown’s boys lacrosse team debuts at the varsity level this season. The roster goes only 18 deep, and just four of them are seniors. “Our dedication’s the big thing,” senior Jared Lyding said, noting that they’ve had a few different coaches in his four years. They followed up their debut with an 11-4 win in a visit to the state’s other new program, Enfield; that was the first varsity game for the Eagles, who are 0-3. Middletown is perfect on the road, actually. Its third win was a 13-6 victory at neighboring Cromwell on Saturday. The Blue Dragons lost 18-4 to Berlin in their home opener Friday. “(The Redcoats) had experience on their end. It definitely showed,” Valery said. They’re home again Thursday, sort of, to face Brookfield across town at Wilson Middle School. The Blue Dragons play four games there in all, and three at the high school. “(We’re) finally possessing an opportunity to showcase what we’ve been working on in the dark the past, like, five years,” Dale said. His tenure as Staples coach will only be seven games old on Saturday, but Will Koshansky is excited to celebrate over 40 years of Wreckers lacrosse history. The program will establish a Hall of Fame at halftime of Saturday’s game against Rye at 3 p.m. The inaugural class includes Christopher Aitkin ’98, two-time all-state player; Ned Batlin ’85, head coach 1995-2001 and assistant coach 1987-90 and 2009-15; Will Mraz ’68, the program’s first head coach; Scott Krauss ’00, whose 119 career goals were a program record; and Jack Ambrose ’10, the Wreckers’ first All-American. The Wreckers, holding at No. 9 in the new GameTimeCT.com poll, were 3-1 going into Tuesday night’s game at unbeaten Fairfield Warde. They won the first three, starting with an overtime win over Germantown Academy of Pennsylvania. They trailed Glastonbury (up a spot to No. 6 this week) 6-2 but came back to make it a game. The Tomahawks won 8-6. Fairfield Ludlowe and Cheshire met at West Point, N.Y., on Saturday for the second year in a row. The Falcons evened the series with this year’s 11-5 win. “It’s a thrill,” Ludlowe coach Chris Parisi said. “You talk about the most idyllic lacrosse setting, the Hudson River on one side, West Point on the other. The teams met at Army’s Shea Stadium, named for Medal of Honor recipient Thomas Shea, who was killed in action in the Korean War. 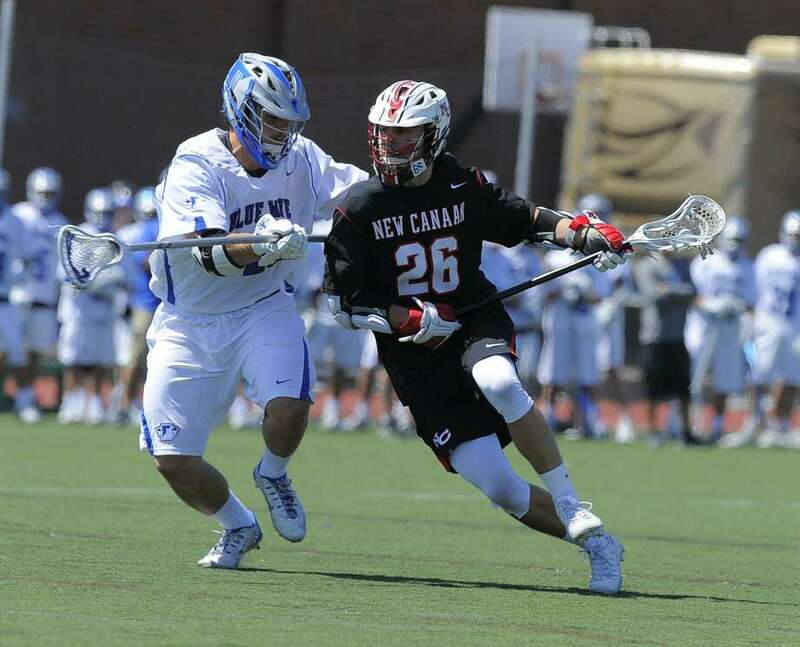 The Intercollegiate Men’s Lacrosse Coaches Association is bringing a Division I college game to Fairfield County for the second year in a row. Vermont will meet Penn at Wilton High on April 27 at 1 p.m. There are 20 state players on the two colleges’ rosters, including Penn sophomore Mark Evanchick, two-time state player of the year at Darien. Last year’s game at New Canaan, a 10-9 Virginia win over Vermont, was followed by a high school game, but the Warriors’ boys and girls are on the road that day. For more information or to order tickets, visit imlcagameoftheweek.com.